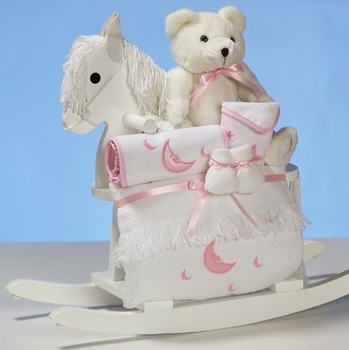 This unique baby girl gift set features a sturdy wooden white painted rocking horse for her to enjoy years of imaginative fun. The coordinated baby necessities are sure to be appreciated by her parents, too! You have 2 options for personalizing this gift. The 1st option is to have the baby�s name embroidered onto a cotton bib. Please click on More Images above to see the personalized bib. The 2nd option is to have the rocking horse personalized with the baby's name. Of course, you can choose to have both personalized to make a very thoughtful gift. This complete collection is beautifully wrapped in sheer tulle before shipping for a stunning presentation!